Not good for the cause but it's funny: Facebook accounts hacked. 4chan have hacked a heap of christian's facebook pages and put inappropriate comments and pics up. I'm trying to feel bad for them. I am, really. Most Xtians are just people living out their lives, like us. That being said, maybe this will get some of the more vocal ones to play the cards a little closer to their chests, hmm? I have a couple of Facebook friends who wallpaper their pages with Jesus stuff. Sigh, yeah, it's not cool to be hacked... but it is rather funny when it's the bigots who are hacked, I admit. LMAO....sorry but this one is just too funny! 4Chan hack everybody - the xtians aren't in a position to feel special. 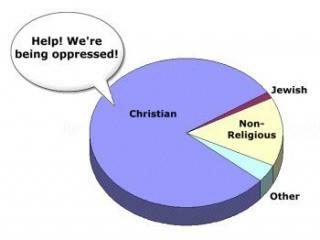 They have to feel persecuted. It doesn't matter that they aren't persecuted any more. The god virus thrives on feeling like an outsider. Have to say, really not helping the cause. Something like this gets overblown as "Atheist groups conspire to terrorize innocent Christians..."
I know what you mean. It's wasn't nice of them, and they shouldn't have done it, but it was pretty funny. I can't help myself on this one. I'm sorry. It was funny, but wrong and it doesn't help us. However, given that this occurred, and given that Atheist Nexus was having access and availability issues a week or so ago, I would strongly suggest that all members of Atheist Nexus who have Facebook Pages and use the same Password for both sites, change your Facebook Password immediately. People should also change their Atheist Nexus passwords. I would also suggest that anyone on Facebook, NOT use any new Facebook Apps designed to appeal to atheists. I would strongly suggest that all members of Atheist Nexus who have Facebook Pages and use the same Password for both sites, change your Facebook Password immediately. I would actually strongly suggest that people never use the same password multiple times for any websites, especially when there isn't strong encryption used between the connections. Most vanilla http information is passed as plain text through the web, with very little obfuscation. Often the only thing protecting your information is the total volume of packets and apathy. I am not sure if many people know this but the Ning platform does support SSL security certificates, so you can use https:// for your nexus connections. Good suggestion and good information regarding the https encryption. That didn't occur to me but you're correct. It's the best way to access all sites that way that will support it.